While it may be difficult to comprehend, entertainment consumes a large portion of Americans’ lives. In 2016, Americans were consuming entertainment media (viewing television, the Internet, mobile apps, etc.) for 10 hours and 39 minutes per day (Koblin, 2016). Therefore, the average American was consuming 306,315.3 hours of entertainment programming in their lifetime (44.3 percent of the average life expectancy calculated at 78.8 years) (Stein, 2016). How many hours of entertainment have you consumed today? When you stop to think how many times you have looked at your social media, personal email, or YouTube, it’s not such a stretch to see how many Americans accumulate 10 hours and 39 minutes of entertainment consumption in a day. Internet content is expected to consist of 82 percent of video traffic by 2020, which will also significantly increase the time spent by Americans consuming entertainment yearly (Cisco Visual Networking Index, 2016). Particularly in the agricultural industry, where less than 2 percent of the nation’s population identifies as a farmer, communication and public relations efforts will rely on messages delivered via entertainment media. Due to the large number of non-farmers in the United States, it is essential for the agricultural industry to utilize transparency in their communication strategies as well as keep up with emerging entertainment trends. Millennials are considered the driving force behind many of the current food trends. They are also the first generation to grow up with the internet, and they desire transparent communications about agriculture and their food (G. Johnson, 2016). One way to have transparency in communications is the use of virtual reality. Virtual reality (VR) seems like it is something out of a futuristic movie, like Steven Spielberg’s Ready Player One (2018). However, the future of VR technology is already available and is gaining popularity with educational institutions through the implementation of virtual field trips. VR is a concept that encompasses several kinds of immersive media that is typically viewed by wearing a headset. The two main components of VR media are 360° videos and augmented reality (AR). The 360° videos are able to provide viewers with an interactive view of the scene. AR is where the viewer has a live view of what is around them, but has additional computer generated (CG) graphics or audio incorporated over the live view. As a Millennial, a farmer, an agricultural communicator, and an Extension Educator, I love the opportunity to share educational information via videos. I believe one way to have true transparency of video messages is through the use of 360° video. This allows the viewer to have the full picture – there’s nothing cropped or hidden from view. Viewers of 360° videos are able to have a true virtual experience of the scene they are viewing. I have had the opportunity to use two 360° video cameras to create several videos for upcoming projects. At the Highland County Fair, September 1-8, 2018, I will be demonstrating VR videos. The video shown below is a 360° video highlighting aerial application of fungicide, the Fallsville Wildlife Area waterfall, my cat (Mr. Socks), and the Hillsboro 4th of July Fireworks finale. If you are viewing the video on a computer, use the circular toggle on the upper left corner to change the perspective of the video. If you are using a mobile device, move your phone around to change the view or use your fingers to drag the screen in multiple directions. The best way to view a 360° video is with a VR headset. If you have access to a VR headset, use the split-screen function to view the video for the optimal experience. Have a good, stable tripod. Be close to the action of the scene, as there is currently no zoom function on 360° cameras. Remember to bring your camera charger if you are planning on a long video shoot. If you are filming in a windy area, utilize a secondary audio source. Use SD cards that have large amounts of available space because the file sizes of high definition 360° videos are large. Allow for more time to edit 360° video content. The GoPro Fusion camera requires two SD cards and needs additional time to render. 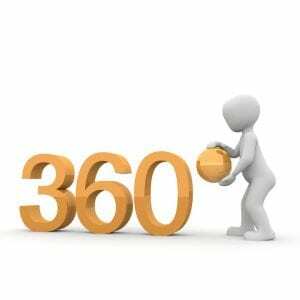 If you are interested in viewing more 360° videos, there are an increasing number of 360° videos online. 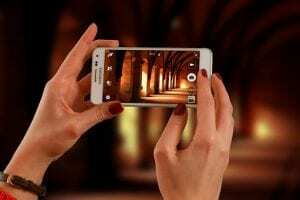 The New York Times has a channel called the Daily 360, National Geographic made the first 360° video in space with the help of astronaut Paolo Nespoli, and Google offers Google Expeditions. You can also find other 360° videos on YouTube. Individuals attending the Highland County Fair this year will have the opportunity to view a different video with a VR headset. The video shown at the fair will highlight agricultural production and the Highland County community. For more information about 360° video production or when the video will be available at the Highland County Fair, contact Brooke Beam at beam.49@osu.edu or at 937-393-1918. Johnson, G. (2016a, February). Food Trends: Consumers Want Healthy, Local Foods. Successful Farming. Spielberg, S. (2018). Ready Player One [Motion Picture]. Brooke Beam is a County Extension Educator, Highland County. Since the turn of the century there has been increasing attention on K-12 education systems and improving the quality of curricula and authentic learning experiences for students entering the 21st century workforce. There is greater emphasis on elevating fields in science, technology, engineering, and mathematics (STEM) in response to workforce demands that are requiring a more tech savvy multidisciplinary skillset. [i] For this reason, numerous new learning approaches, curricula, programs, community partnerships, and specialized schools are emerging. [ii] While most of these initiatives address one or more of the STEM subjects separately, there are increasing calls for emphasizing connections between and among the subjects, as well as bringing real world problems into the classroom through business and industry partnerships with educators. STEM is rapidly transcending into a verb, describing inclusionary critical thinking skills to solving everyday real world problems facing our communities and socioeconomics. Education advocates and academic researchers find that a more integrated, problem-based, hands-on learning approach is vital to the K-12 education. [iii] This is because it gives students applied skillsets that today’s workforce requires. These advocates find educational impacts increase when K-12 educators involve solving real world problems. The education impacts are furthering impacts when the educators include business and industry partnerships that support the problem-based learning approach. These authentic partnered learning approaches make STEM subjects more relevant to students, teachers, and program participates. [iv], [v] This in turn can boost motivation in the learning process and improve students’ interest, achievement, and persistence in schooling and become lifelong learners. Being and remaining a lifelong learner is critical for success in the 21st century. These outcomes, STEM advocates are asserting, will help address calls for greater workplace and college readiness as well as increasing the number of students considering STEM careers; where currently 40% of STEM jobs go unfilled due to applicants not having the required skillsets. [vi] Extension can be a solution to closing the 21st century skillset deficit and connecting our youth to STEM skillsets and career pathways. For over a year and a half, my particular Extension programmatic focus has been on preparing Pickaway County youth for STEM education and the 21st century workforce. I work collaboratively with a team of Extension professionals, volunteers, campus collaborators, and community partners to provide leadership for the development, production, and evaluation of educational programs and applied research to foster STEM educational opportunities that increase career attainment in STEM fields. More specifically, I work to provide leadership and programming to meet current and future needs related to K-12 STEM education with Pickaway County schools. I work in conjunction with the Pickaway County Educational Service Center, Pickaway HELPS, Pickaway WORKS, school district curriculum directors, K-12 teachers, business leaders, economic development organizations, local business and industry, and the Ohio State University collaborators. 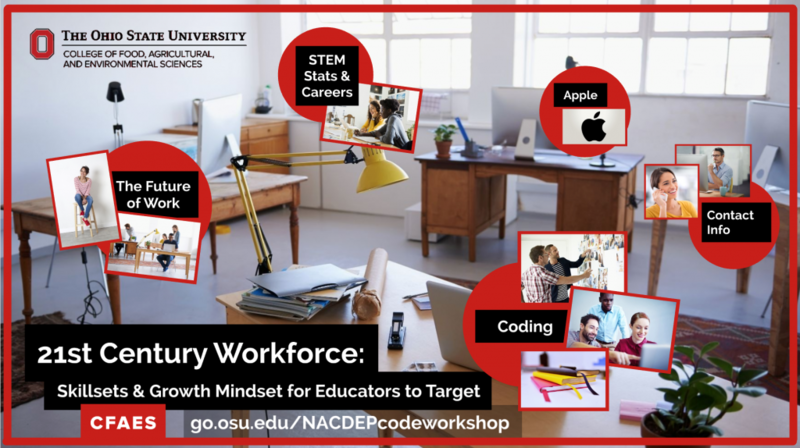 Figure 1: NACDEP 2018 presentation clip highlighting the workshop agenda, “21st Century Workforce: skillsets & Growth Mindset for Educators to Target.” Retrieved from: go.osu.edu/NACDEPcodeworkshop. This spring I took my STEM programming on the road to the National Association of Community Development Extension Professionals in Cleveland, OH to present on the 21st century workforce, the applied skillsets required, and a hands-on coding challenge to educators across the country. Coding literacy is a 21st century requirement, which gives us a skillset to participate in the digital world. We should not just learn how to use computers and technology, we should develop applied programming that inspires and builds confidence for our communities and youth participates to learn to program computers – to be drivers in the digital world, not passengers. If this is something that interests you, visit the resource links below and start learning. Video: video highlights OSU Extension Sphero Coding Programs. The first clip, was filmed by Brooke Beam, OSU Extension Educator. Brooke recorded Extension Educators from across the country engaging in Sphero coding challenges at the 2018 NACDEP Conference in Cleveland, OH. 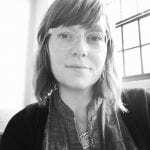 The following videos and photos were recorded or taken by Meghan Thoreau. All iPads and Spheros came from Apple Education. The music is by Stromae, Tous les Mêmes. The video highlights Sphero (one connected education toy I include in my coding programs), but there are dozens of connected toys for educators to choose from. For example, the educational Parrot Drones can be programmed through code and is a great tool for educators looking to innovative their youth and adult Extension programs. Knowledge in drone technology is an example of how technology impacts the future of work. UPS is actively testing residential drone delivery, where a traditional delivery driver will soon have to add programming a drone to their daily tasks. Electric vehicle maker Workhorse Group (based in Columbus, OH) is working with delivery companies in actual use. Domino’s is currently delivering pizza via ground drones in Europe and New Zealand with more cities scheduled to go online in the very near future. Amazon, the e-commerce giant, tested its first drone deliveries in the U.K. in 2016. 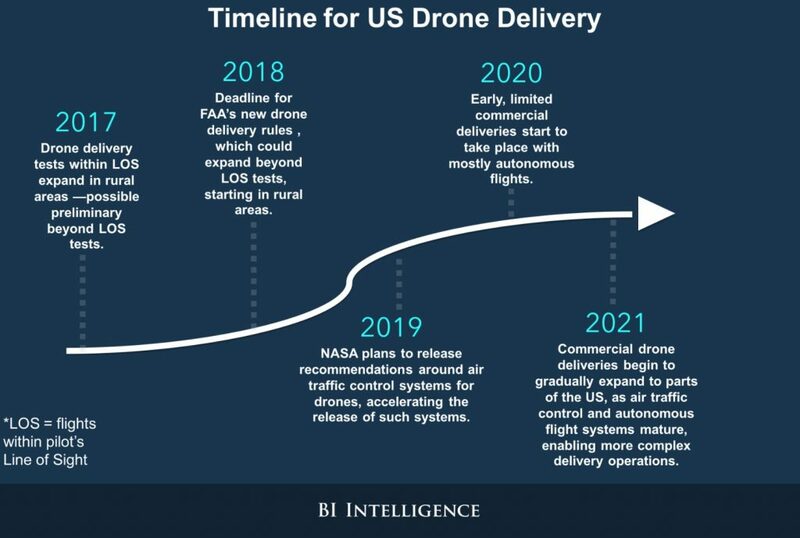 Infographic retrieved from: Shop online and get your items delivery by a drone delivery service: The future Amazon and Domino’s have envisioned for us, businessinsider.com/delivery-drones-market-service-2017-7. But back to basic entry level coding. Connected toys, robotics, gaming, all make code interactive and fun learning, but it is also a critical skillset to today’s workforce. Instilling the importance of lifelong learning extends from the educators to their students, but it must also be from the employers to their workforce so that we may all support and incorporate more technology into curriculum, programming, outreach, and work itself. The shift to applied programming is central for Extension being a solution to closing the skillset deficit and connecting our youth to STEM career pathways through hands-on connected learning that is developed around real-world problem solving. I have personally watched and listened to my youth participants, and they have become more curious, focused, and engaged in a STEM education and problem solving. The hands-on programming excites them beyond the program itself or their classroom. For example, after teaching a two-day computer science program with four elementary school buildings I returned the following month to be bombarded by students who wanted to share all the coding challenges they tried at home with me. The students engaged in self-directed learning. Extension provided the students and parents with a coding factsheet that highlighted several online sites that offer self-directed code challenges to get kids coding. Several even returned after winter break with their own Spheros. I witnessed a switch – the students did not just want to get a new game to play, they wanted a connected toy to code and write programs for themselves. Figure 2: presentation slide that highlights the new OSU Digital Flagship Initiative. 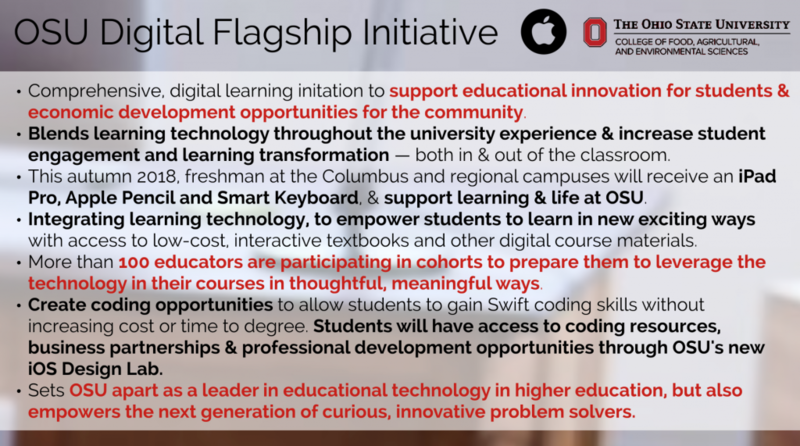 I’m actively working with a team of Ohio State professionals to support Extension’s consideration in this exciting initiative and hopefully rally interest in organizing an Extension Digital Flagship Educators Cohort to bring the digital impacts of this initiative statewide through employing innovative technology, curriculum, and coding resources more comprehensively within our OSU Extension programs and outreach. Adopt a growth mindset. This approach helps educators continue learning and problem solving through challenges. It is important for educators to fight through lifelong learning and remain a driver in the digital age, not a user. Be creative, curious, and adaptive. A person learns best on the job. Therefore, bring real world problems and technology to your programs. 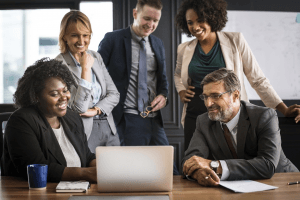 Educators embrace technology and lifelong learning, look to community partners, and business and industry leaders to engage in the K-12 learning experience. STEM matters. Technology matters. Both are essential to the 21st century teaching and learning programs. K-12 Education requires over-lapping STEM technology with real world problems and partnering with educators, business, and industry to close the 21st century skillset deficit. Educators must be knowledgeable about technology, be critical thinkers, and problem-solvers to prepare our youth for the real and ever-evolving workforce. [i] Fayer, Stella, Lacey, A., Watson, A. (2017, January). STEM occupations: past, present, and future. United States Bureau of Labor Statistics. Retrieved from: https://www.bls.gov/spotlight/2017/science-technology-engineering-and-mathematics-stem-occupations-past-present-and-future/home.htm. [iv] Honey, Margaret, Pearson, G. Schweingruber, H. (2014). STEM Integration in K-12 Education: status, prospects, and an agenda for research. Committee on Integrated STEM Education of the National Acaemy of Engineering and National Research Council of the National Academies. Retrieved from: http://stemoregon.org/wp-content/uploads/2014/04/STEM-Integration-in-K12-Education-Book-Ginger-recommendation-from-OACTE.pdf. [v] Fayer, Stella, Lacey, A., Watson, A. (2017, January). STEM occupations: past, present, and future. United States Bureau of Labor Statistics. Retrieved from: https://www.bls.gov/spotlight/2017/science-technology-engineering-and-mathematics-stem-occupations-past-present-and-future/home.htm. [vi] Fayer, Stella, Lacey, A., Watson, A. (2017, January). STEM occupations: past, present, and future. United States Bureau of Labor Statistics. Retrieved from: https://www.bls.gov/spotlight/2017/science-technology-engineering-and-mathematics-stem-occupations-past-present-and-future/home.htm. [viii] Engler, John. (2012, June). STEM Education Is the Key to the U.S.’s Economic Future: we need to encourage more students to pursue science, technology, engineering, and math. Retrieved from: https://www.usnews.com/opinion/articles/2012/06/15/stem-education-is-the-key-to-the-uss-economic-future. 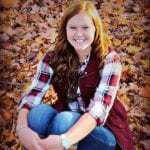 Meghan Thoreau is a County Extension Educator for Pickaway County. There are only so many hours in a day and yet our work never seems to end. How can we better extend our reach and increase awareness of Extension? For almost three years we have been using technology to enhance our efforts to inform and interact with the publics we serve. 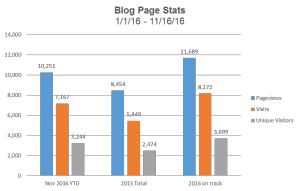 We drive web travelers to this very blog using popular social networking tools such as Facebook, LinkedIn, and Twitter. Together, these tools and the blog link users to our other web-based content that includes podcasts, videos, and a variety of downloadable materials. In days past, we assembled a quarterly newsletter that required formatting, copying, and then hard copy distribution. With the advent of email, that approach gave way to an electronic PDF version that could be sent to an email list. The web enabled us to post the PDF but who would actually go there to read it? Today, we are reaching literally thousands of people, many of whom are connecting with us for the very first time. Not only are they able to acquire the specific content that is of interest to them, we are also now able to interact in ways we could not ever before. The entire staff plays a creative role which has built a real sense of teamwork. And knowing we are extending our reach and increasing awareness of Extension has been very motivating as well! To learn more about our approach, please feel free to contact me or any of the CD team members. To see how it could work for you, take the opportunity to investigate some of the recent posts, categories or tags that interest you on the left side of your screen. Notice how you can share the content you like with others, interact with the author and others who have an interest in the topic, and find additional information linked to the post. Enjoy!! Greg Davis is the Assistant Director for OSU Extension, Community Development. Cities have been known as centers for innovation and progress for as long as they have existed. This is especially true in the technology sector, as cities often produce new methods of communicating and living with technology. Technology has become a very integral part of society, having something to do with virtually every aspect of our lives, in urban, suburban, and rural regions. As technology becomes more and more prevalent, the need to keep up with the technological changes grows as well. There are already many ways that Extension uses technology to disseminate information and knowledge, reach a larger audience, facilitate professional development, and communicate more efficiently with their local community (Typhinia). Urban Extension programs have the most to gain from maximizing technology use for their various programs due to their large population base (Schneider). There are many innovative ways of using technology to better communicate with residents, and distribute knowledge on a larger scale, boosting Extension’s presence. There is also an opportunity to become more relevant with a younger generation who otherwise would not use Extension’s services (Typhinia). These connections can be made by social media use, as well as offering new programs that are more based around technology, that would facilitate greater interest among youth and young adults, as well as potentially connect Extension with other programs/partners who are interested in the tech side of youth development(Typhinia). Extension in the City is also in a position to address an ever increasing opportunity gap in the inner cities in America. Those who are often victims of the digital divide are disproportionately in five groups. Age, income/educational attainment levels, community type, people with disabilities, and language (Mapping the Digital Divide). 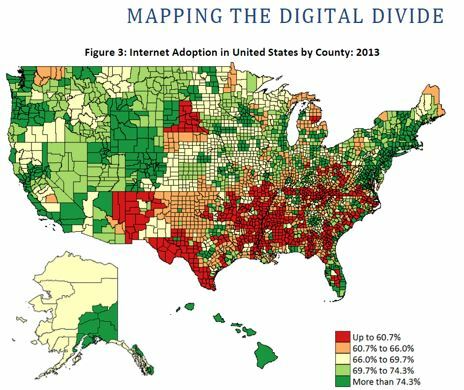 In a brief released by the White House, the digital divide and how to map it were discussed. The unit of measurement consisted of internet access, educational attainment, age, and household income (Mapping the Digital Divide). Kudryavtsev, Alexey, Marianne Krasny, Gretchen Ferenz, and Lisa Babcock. “Use of Computer Technologies by Educators in Urban Community Science Education Programs.” Journal of Extension5 (2007): n. pag. Extension Journal, Oct. 2007. Web. Sept. 2015. Schneider, Sandra, Donna-Jean Brock, Crystal Lane, Peggy Meszaros, and Barbara Lockee. 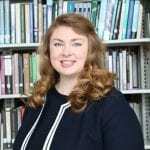 “Using Information Technology to Forge Connections in an Extension Service Project.” Journal of Extension6 (2011): n. pag. Extension Journal, Dec. 2011. Web. Sept. 2015. Typhinia, Eli, Robert Bardon, and Laurie Gharis. “Collaborating with Your Clients Using Social Media & Mobile Communications.” Journal of Extension 53.1 (2015): n. pag. Extension Journal, Feb. 2015. Web. Sept. 2015.